Artists sometimes use color theory in developing their artwork. 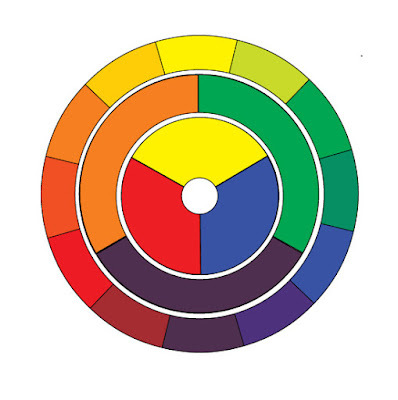 The color wheel is is used in color theory as a way of arranging colors so that artists can use the information in a systematic way to get consistent results. This post is a basic introduction to color theory and the color wheel. 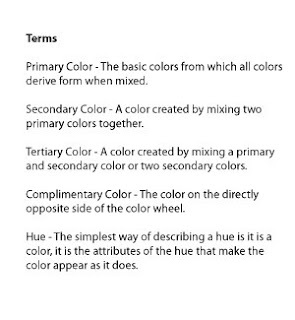 There are many types of color theories out there and they each serve a different purpose and medium, we will focus on what is useful for those who paint and draw. 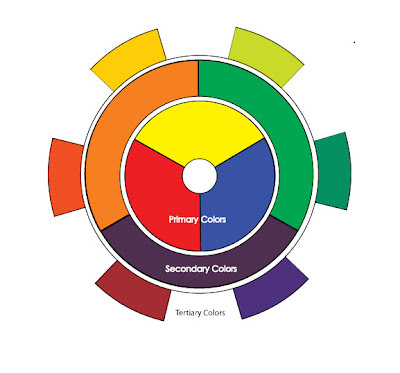 As you can see above, the color wheel is arranged in a way where colors similar to each other sit next to each other on the wheel. This will provide valuable information later on. The color wheel is built from the foundation of three colors, red; yellow, and blue. These are called the primary colors. It is these first three colors that will create the rest of the colors on the wheel when mixed together. If you were to mix all the primaries together you would get black. 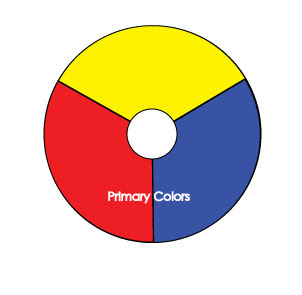 Below is a example of the simplest of color wheels, using just the primary colors. The secondary colors are the first colors to be created when mixing two of the primary colors together. Mixing yellow and blue creates green, yellow and red creates orange, blue and red creates purple. This class of colors will be important later on because each one is a complimentary color to a primary color. Below is an example of a color wheel using just the secondary colors on the outside ring. In the simplest of terms, tertiary colors are all the rest of the colors that can be created. 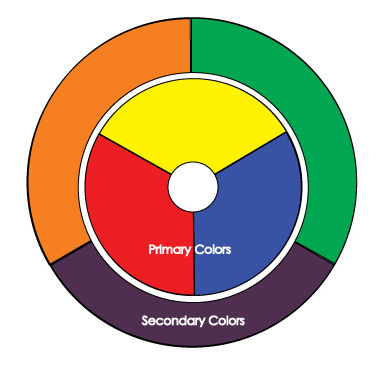 To define or describe tertiary colors, these are the colors created when mixing a primary and a secondary color together or two secondary colors together. 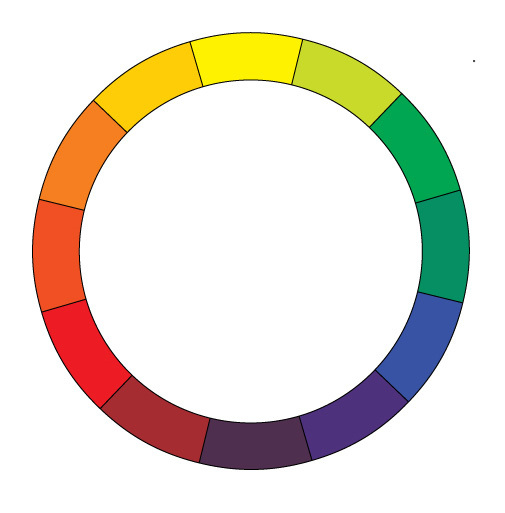 Below is an example of a color wheel with only tertiary colors on the outside ring. Finally we have an example of a twelve step color wheel. I have included the previous charts of primaries and secondaries to show how the wheel is created. First the primary colors are laid down. Then the secondary colors are mixed and laid down in the proper place on the wheel, which is midway between the placement of the primary colors. Then using the primary and secondary colors, the tertiary colors are mixed an laid down in the position on the wheel based on the hue relationship to other colors. It belongs between the colors that it is most similar to. Later we can look at some other important elements of the color wheel and how the wheel can be used in developing color composition. Below is a sample of a twelve step color wheel. Try making one, using just the primary colors. Start by making as many transitions in color you you are comfortable doing. Maybe start by creating a color wheel of just the primary and secondary colors. Then move up to a twelve step color wheel. You can then take this even further and create as many steps in color you would like.